The founding of our department began with the implementation of transformation by the government in 1950, setting up the Central Reconstruction Committee, and beginning to plan and establish the country's advanced business management training course. The department commenced its operations in 1951 and was also the head start of Taiwan's enterprise management education. In 1953, it was taken over by Taiwan Provincial Administrative College. In 1955, the department was upgraded to the Department of Business Administration of the Taiwan Provincial Legislative Business School. In 1961, it merged with the Taiwan Provincial Agricultural College, and was reorganized into the Department of Business Administration of the Taiwan Provincial Chung Hsing University. In 1966, the name was changed to “Department of Business Administration.” In 1988, it was divided into two classes, A and B. In 1964, the night division of the Department of Business Administration in Taipei campus began enrolling students. In 1971, the department’s night division was divided into the business management group and the market management group. The Graduate School of Business Administration was established in 1984 with doctorate and master’s programs, as well as an in-service program for personnel of small and medium-sized enterprises (jointly organized with the ROC Association of Small and Medium-sized Enterprises) and an in-service program for corporate managers (jointly organized with the International Chamber of Commerce of ROC and the Management Consultant Training Course (jointly organized with the SMEs of the Ministry of Economic Affairs). We welcome students regardless of their academic and professional backgrounds, especially those who have work experiences, so that management knowledge gained in private enterprise can be shared with classmates and so that lessons learned from fellow students can thus be shared with society at large. In 1992, the night division in continuing education was eliminated and the students were shifted to be Classes A and B. Day students may enroll in classes taken by night students, and vice-versa. In 1997, with the implementation of a new law affecting university, the night division was transformed into the division of continuing education on the Taipei campus. In the same year, due to these regulations, the department entered a new era with merging of the department and school. The integration of the resources and the merging of the department and school strengthened the faculty and research capabilities of the department, and also allowed undergraduate students to interact with graduate students and thus expand their horizons. Training professional managers with both theoretical knowledge and practical experience, as well as with the ability to conceptualize ideas, has always been the focus and goal of the master’s program. In view of this, in addition to actively recruiting outstanding professors from various schools, the EMBA program was founded in 1999, attracting political and business elites and emphasizing practical discussions. In recent years, in order to train middle-level management talent with international perspectives for the country’s benefit, the master’s program has adopted multiple entrance programs. In addition to enrolling students majoring in business administration, we also recruit students from various academic backgrounds like technology or foreign languages. We cultivate their management knowledge and capabilities to meet the needs of the country and industry. In February 1990, the university was redesigned as National Taipei University. The department was originally affiliated with the College of Law and Business of National Chung Hsing University and was transferred to the College of Business of National Taipei University. In 2003, the department was moved to the Sanxia location and retained its executive master’s program and the in-service group of the master’s program at the Taipei campus. Due to the efforts of faculty and students in all departments, the department passed its evaluation by the Ministry of Education in 2010. The results proved that the department of Business Administration is excellent both in terms of teaching and the performance of its graduates. The department has continued the fine traditions and academic spirit of the College of Law and Business of National Chung Hsing University for 50 years. It is committed to cultivating outstanding talent with international perspectives and broad perspectives, and has developed a variety of courses for students to take in order to adapt to the world’s trends and improve their international competitiveness. The operation of the dual campus locations of our department also brings new challenges and opportunities. The development of the Sanxia campus is mainly focused on the improvement of research and teaching; the Taipei campus keeps up the fine tradition of cultivating Taiwanese management talent. Besides, the Taipei campus is located in the center of Taipei City, so the EMBA and in-service group of the MBA programs have become one of the most popular master’s programs in Taiwan. Most of the teachers have Ph.D. and rich practical experience. 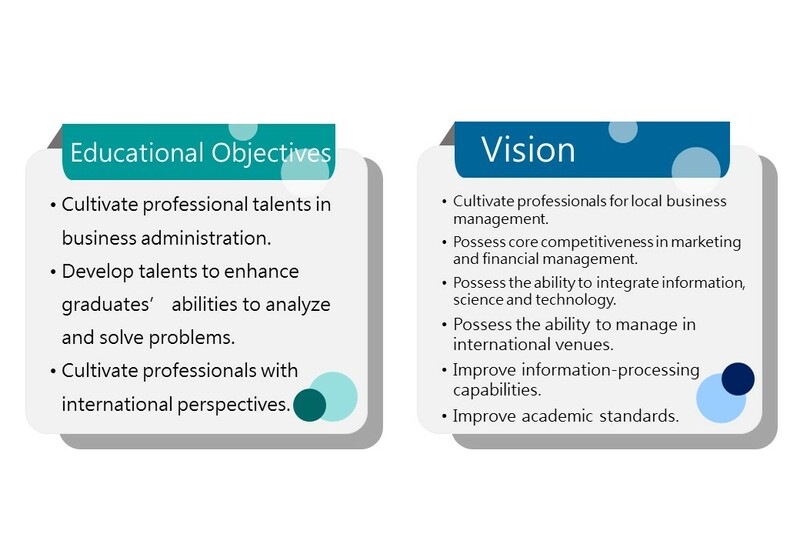 The purpose of this department is to "cultivate the enterprise management talents required by the industry", and to improve the effectiveness and efficiency of industrial management by cultivating the management talent required for the knowledge economy industry, in order to boost Taiwan’s industrial development and enhance its international competitiveness. The Department of Business Administration offers graduate programs (Ph.D., master’s and EMBA), undergraduate programs, executive master’s program. The department has about 1,500 students, and about 30 professors. The department begins with establishing the educational foundation needed for further business management studies and provides diversified education and training. We train management human resources with international perspectives for the benefit of society, use geographical advantages to strengthen the core competitiveness of our marketing and financial management, and also train students' ability to integrate science and technology.